The only app that creates/deletes/manages Poweramp playlists !!! NEW!!! Poweramp V3 alternative skin. A truly unique skin is soon to be published on Google App Store for Poweramp V3. Click here to preview. New Playlist Manager offers a lot of integration with Poweramp. New Playlist Manager has the ability to export and import your Poweramp "ratings" and "times played", something you cannot do with Poweramp. New Playlist Manager has the ability update your Poweramp "ratings" from the ID3V2 POPM tag of your music tracks, something you cannot do with Poweramp. 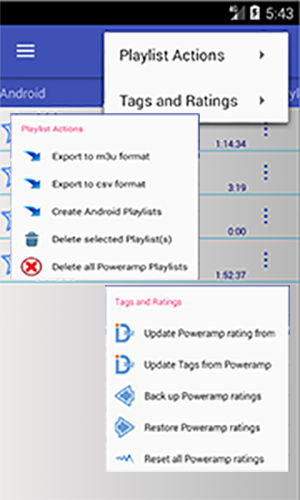 New Playlist Manager has the ability update the ID3V2 POPM tag of your music tracks using its Poweramp rating, something you cannot do with Poweramp. Create a comma delimited text file containing your playlist's music details which you can upload to Soundcloud or other sites. It is very easy to back up your Poweramp ratings. Simply select the "Export Poweramp Ratings" option. This will create a text file named as poweramp_ratings.txt in the default folder playlist_manager with all the necessary details. The import procedure is started by selecting the "Import Poweramp Ratings" option. Poweramp has no functionality to export the ratings settings. If you were to move to a new phone for instance, it is certain that you will lose all your ratings and would have to start again. Export the ratings using the menu option. This will create a new file called poweramp_ratings.txt in a folder called playlist_manager. 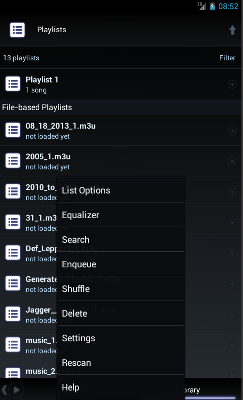 On your new device, let New Playlist Manager create the folder playlist_manager. You can do this by exporting any playlist as an m3u playlist. This process will create the folder if it does not already exists. Copy the file poweramp_ratings.txt file created under Step1 to your new device and place it in the playlist_manager folder of the new device. Copy all your music from the old device to the new one. Where you place these is not really important. 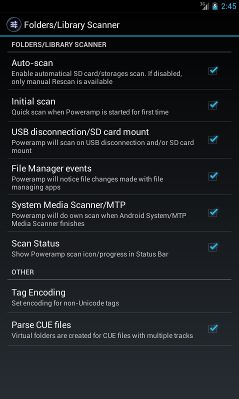 Make sure Poweramp and Android have finished their media scanning. Finally "Import Poweramp ratings" to complete the process. Your ratings will now be back!! As you listen to your music, you may rate your songs using Poweramp. Over time you may have rated most or all of your music. You should be aware that these ratings are only held in the Poweramp database and can not be backed up using Poweramp. The Poweramp User Forum has many posts from lots of users who have lost their ratings when moving to a new phone or when their android firmware was updated. With New Playlist Manager, you can back up your ratings and times played by writing them to the actual track itself, in the same way you can edit tags such as artist, album etc. If you do this regularly your ratings can easily be restored should something ontoward happen and you lost your ratings. 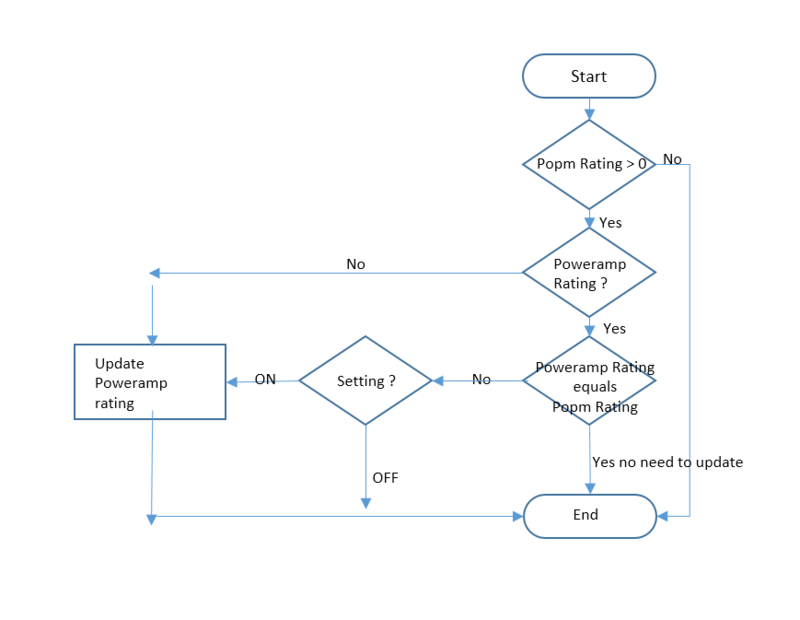 Should you find you have lost your ratings, either by a new install of Poweramp or some other reason, assuming you regularly updated your music's ID3V2 tags with New Playlist Manager, using the restore functionality will reinstate your ratings. The logic in determining which tracks to update id shown in this flow chart. Be aware that this process may take some time but you will receive a notification once it completes. Note: If you use Windows Media Player on a pc to maintain your ratings, make sure you select Tools, Apply Media information changes, to ensure the ratings are written to the POPM tag of the track. Without this update, your ratings are only held within the Windows Media Player database. For more details and a step by step guide, read more. Watch the video clip here or read on..
Poweramp maintains playlists in its own database. As a result, any playlists created by another player or android based app such as Playlist Manager will not show in the Poweramp interface. However, the m3u format makes playlists interchangeable. Most decent music players are able to handle this format and given Poweramp is one of the most popular players, I have provided this brief guide. 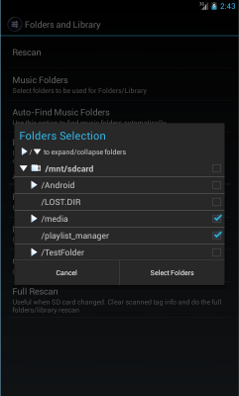 Make sure you include the folder named playlist_manager as this is where the m3u playlists are written. 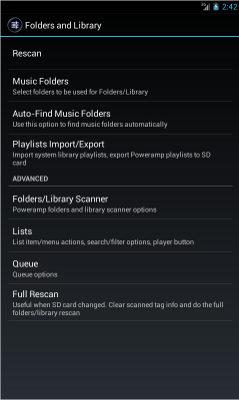 The last step is to ensure that Poweramp scans the appropriate folder when you launch the player. You do this by by selecting Folders/Library Scanner. Select the Auto Scan options. Return to the Library and if the newly created playlists are not visible, simply select Rescan from the menu as shown below. Your new playlists will now appear.